A special thank you to long time reader of this blog Rolf for this review of the Dali Jerusalem Bible. 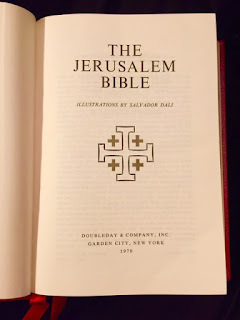 The Jerusalem Bible (Salvador Dali illustrated) edition is a Bible that I had been 'watching' on ebay for a very long time. It was published in 1970, but it makes frequent appearances on ebay usually for $150.+ I was able to obtain this copy at auction in new like condition for about $65. shipped. This is a huge Bible: 12 x 8 1/2 x 2 3/4 inches and it weighs a little less than a smart car! 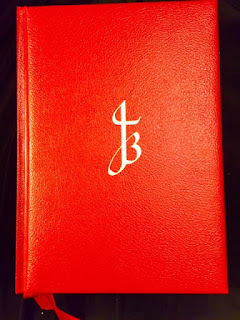 The Bible is bound in red (bonded, genuine or faux?) padded leather over boards. I am not sure, I have read that it is leather and faux leather but the slightly padded hardcover looks nice and works well with this big Bible! 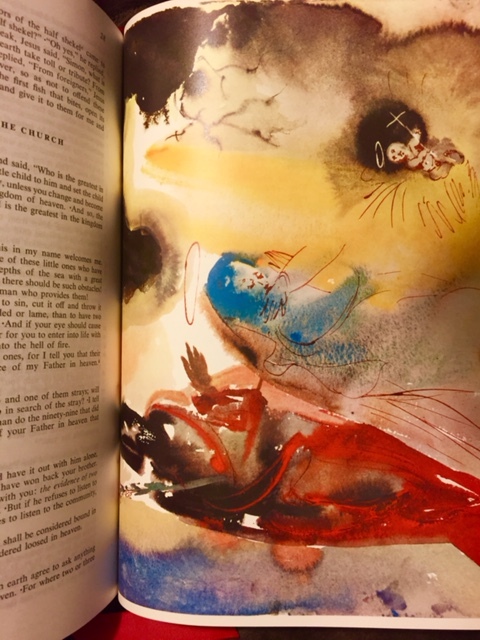 The Salvador Dali illustrations are all full page and there are 32 of them. Dali's illustrations can be strange, but they always make you think when you see them. The real reason I wanted this Bible was for a chance to read a large print Jerusalem Bible! 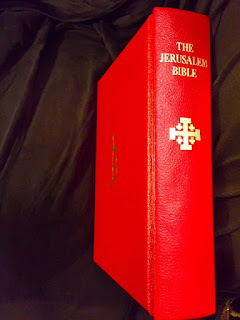 I have three other Jerusalem Bibles, two with size 9 print and a compact with size 7 print. 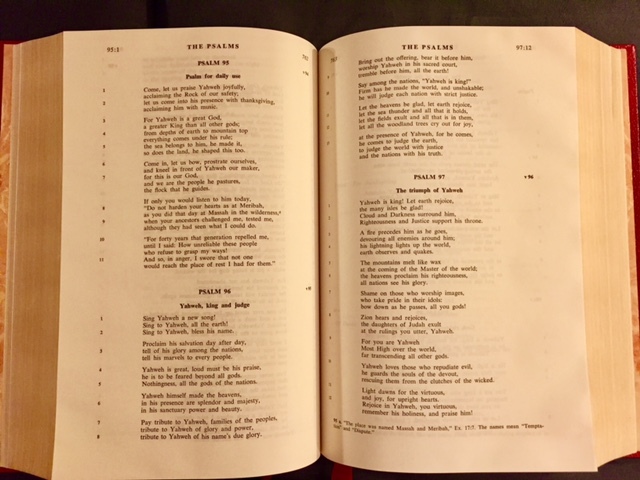 When I found out that this Bible had size 11 (well spaced) single column print, I had to get one! The paper is thick and bleed through is very well controlled! The illustrations are on much heavier paper and are quality prints. It comes with two very nice and wide red ribbon markers. This is a table top/ lap type Bible, but it is a great reading/ devotional Bible (with minimal notes/reference numbers at bottom of the page)! Is it worth $150.? In excellent condition I think it is! 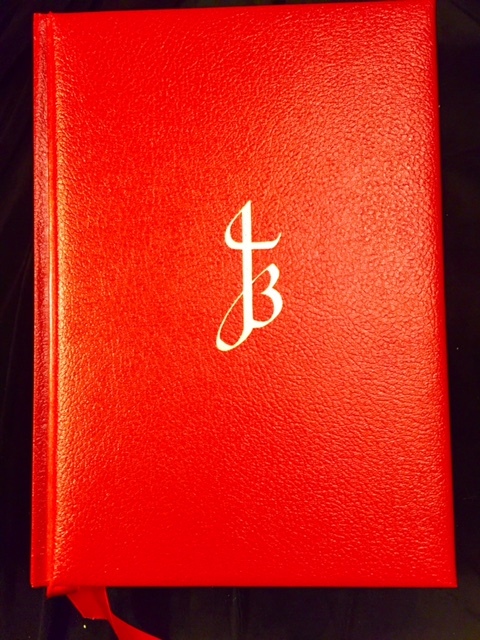 With high end Bibles now selling for $250-$300.+ and bonded leather study bibles nearing the $100. mark, I would say yes! But maybe with a little looking around it could be found cheaper! I am not crazy about some of the Dali illustrations, some are good, but some look as if he dashed them off in a moment. Still the bigger print is a plus. I recently took out the 2nd edition of the Oxford Catholic Study Bible and found that the small print meant that I couldn't read the notes very well, at least not in my living room with a modest lamp. Yeah Jerry, the two prints shown in this post are good and there are others, but some are (imho) weird. But art is in the eye of the beholder, Picasso's cubism is not my thing but his paintings sell for tens of millions of dollars! I would have bought this bible even if it did not have any illustrations! 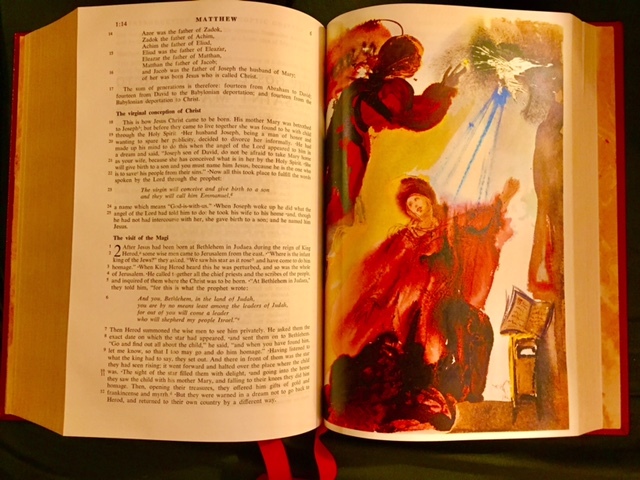 It is very nice to put it in your lap and read that beautiful page of scripture. This bible sit right next to my reading chair! I hadn't seen Dali watercolors before and by evidence of these illustration he was a fine watercolorist. His tower of Babel is a good modernist illustration. I wish those who commissioned him had been a little more critical before accepting his work. Dali's conversion (reversion?) story is fascinating, and he devoted much of his later artistic work to religious themes.